Cate`s Place: My Day April Showers Mug Rug Blog Hop! My Day April Showers Mug Rug Blog Hop! This is my day on the April Showers Blog Hop. I can`t wait to see what today`s other participants will share ! We are making mug rugs with an April Showers theme. Madame Samm is our gracious hostess and Erin at Sew At Home Mummy is our hardworking cheerleader. Giveaways and tutorials are offered by some participants. Please visit the blogs listed below my pictures. There are wonderous mug rugs waiting for you! Here we are in the tree again, LOL. My mug rug is 10" x 8". A gift for my daughter in law and roomy for her desk. The front is made with 100% cotton vintage reproduction fabric purchased at Jane`s Fabrics. The pattern name is Bee`s Knees by Glenna Hailey. The trim is vintage cotton eyelet fussy cut from a doily in my stash. April showers in high desert bring wildflowers and then a bounty of bees. 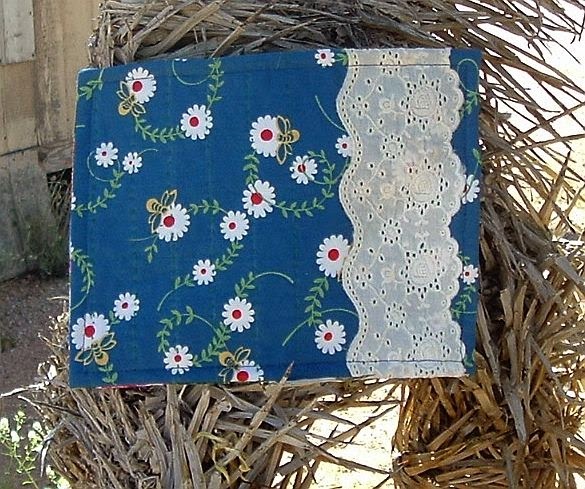 This fabric pretty much expresses our April and blue is DIL`s favorite color. 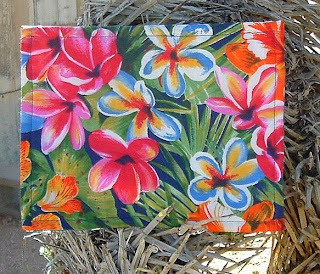 The reverse is a 100% cotton tropical flower print. I love the bright colors and the palm fronds. Palm trees are easily grown here though in winter the smaller palms sometimes need cover. Date palms are prevalent south of us in places like Havasu, Parker and Yuma and of course in Phoenix. Here is THE LIST! I hope you have time to visit these wonderful sewists / artists. Thank you! You are now at Cate`s Linens (me). What a lovely sweet mugrug you made. What a beautiful gift! Thanks for sharing. Cate, what a dear mug rug you made for your DIL, it's lovely, I like the bleu fabric and colorful back. Thanks for sharing! So pretty! I love the lace! Very pretty mug rug. That lace really tops it off!! Great mug rug - I love the bright flowers on the reverse! Ohh love the colors and the back as well as the front...have a super day. Lovely - thanks for sharing. Pretty...I love the doily trim! I love the color of your fabric. You did a nice job! Very cute... I'm sure your DIL will love it! nice rugs - thanks for sharing. I forgot to tell you that I'm a new follower here and today is also my day, I hope you visit me! Those flowers are beautiful. Nice job! Your mug rug is great. The trim is a nice touch. I photograph a lot of my quilts by hanging them in our desert willow so I laughed when you said you were in the tree again. What beautiful fabrics you used. That a nice one. Love the flowers. Great colors. Loveeeeee daisy - the eyelet boarder completes it - very nice. I love that blue fabric! And the lace gives it a nice finishing touch! Love these small quilts as you can try new techniques. Your daughter will love. Thanks for sharing. Your mug rugs are both so pretty! I know they will be enjoyed! Your mug rug is so very pretty with the vintage lace. And the fabric on the back is gorgeous. You did a wonderful job. I know your DIL will love it. Thank you so much for sharing. After reading your description of your fabric choices and such, then this is going to be perfect for your DIL. I love the pop of color on the back so she can pick a side that fits her mood perfectly! Pretty colors, I like them. Very pretty! I love reversible mug rugs--then, if you spill you can turn it over! Your daughter-in-law will love it. That will be such a nice gift for your DIL. I also love the plumeria flower backing. How pretty! I love the lace embellishment and the backing fabric! Two great mug rugs! Love the piece of lace on the first. Very pretty! LOvely mug rug! The lace is a great touch. Thank you for sharing. Very pretty and I love that it is reversible! Very pretty mug rug. Love those flowers on the back. Great idea. It made up beautifully. Love your mug rug. I wouldn't have thought about the lace on the side. Very cool. Love your florals and lace. They have given me some new ideas for mug rugs for my kiddos. Thanks for sharing. Very pretty mug rug. Love the bright colors. very pretty work!! thanks for sharing!! 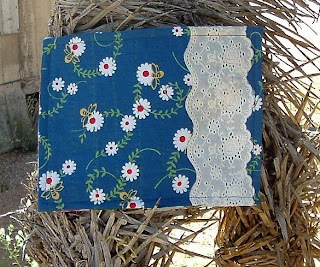 Great fabric choice for the front of the mug rug; love how the lace looks against that pretty blue. Thanks for sharing. lovelz springtime mugrugs, thanks for sharing! Bright and cheery mug rug...love it! How lovely. I love those gorgeous prints. Your mug rug is very lovely. what a sweet rug. I'm sure her coworkers will be very jealous. Great job. Sew pretty. Love the lace. makes it look so delicate. Very pretty and Spring looking. Thanks for sharing. I love the lace. I love the vintage style of the front, and the great print on the back. Reversible! Both sides are beautiful! I love the eyelet lace! Thanks for participating and inspiring us! That is one of the prettiest mug rugs I have ever seen. Not sure if it's the print or the eyelet, but I like it! Lovely! The eyelet really compliments the pretty blue. I love the addition of the lace. Very lovely! So pretty... the lace is a great touch and I love the bright backing fabric. Very bright and perfect for spring. Nice work! Thanks for sharing. Beautiful - and I love the vintage trim! Thank you so much for participating with us! I'm a little behind in checking out the mug rugs, but wanted to let you know that I love your fabric choices. Very pretty with the lace! Thanks for sharing!